As most people in North Carolina, and many across the nation, have heard by now, our state has had many controversial episodes this past year, starting with the aberration formerly known as “HB2,” which is a Bill that more or less states that transgender people must use the bathroom matching the gender on their birth certificate. Why our government lawmakers felt the need to waste time on that when they should be focused on improving the quality of life in NC is beyond me. 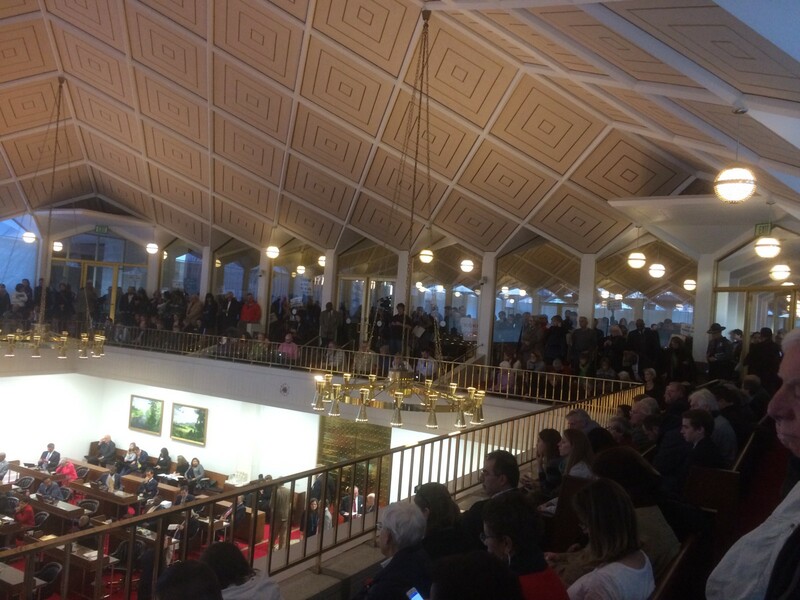 The latest came via a “special session” called by the North Carolina General Assembly (NCGA) last Wednesday, December 14 under the guise of additional aid for the Hurricane Matthew victims. These special sessions have been a rush job of sloppy legislation that not only harms our economy, but our people and our reputation. Rushed legislation shouldn’t happen. Legislation has great effects so we should go about it more practically. Why aren’t our legislators thinking more deeply about the laws we’re passing? They are building on our history and our future. 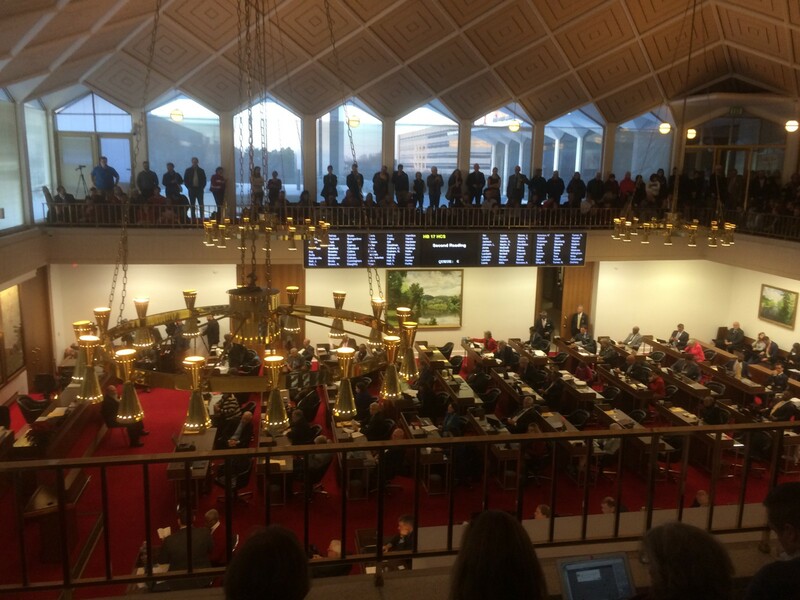 I wondered about this latest special session so, since I was able to adjust my schedule Thursday afternoon, I went to the NCGA to hear about this for myself. I arrived at about 4:15pm and entered the Legislative Building not knowing what I was about to experience. Listening to the explanations of House Bill 17 (HB17), also known as SB4, I found myself astonished. Curious about the history? Read its fast timeline for yourself. This isn’t even the first time something like this has been done. With the arrival of Governor Pat McCrory in 2013, House Rules Chair David Lewis was behind a movement to increase appointment powers. The startling dishonesty power grabs are well-documented by Chris Fitzsimon, of NC Policy Watch. As you’ll see, in 2013, the appointments increased from 300 to 1500. Now they’re reduced from 1500 to 300 again. It would interfere with Education and Election appointments, and then some, interfering with offices that were previously meant to be nonpartisan or those in line with a governor’s focus. It’s far more of an ominous move than just a partisan power grab. Members of the House stood and voiced their opposition. “Unconstitutional.” “Overreaching.” “Interfering with the change in leadership.” “Unprecedented.” By the way, I saw that Senator Thom Tillis just put forth a proposal to freeze the President’s power to appoint people in transition from one administration to another. I wonder what he would think of McCrory’s influential part in this move. Former Governor Jim Martin, a Republican, also criticized HB17 in a joint statement with Democratic former Governor Jim Hunt. Democratic and Republican; one by one, they stood and voiced opposition until it was time to call for a vote. I wanted to cheer, and whispered this to the fellow next to me, “Don’t. You’ll get thrown out,” He replied. “I won’t. I’m just glad that people are taking a stand.” I remained silent, but hopeful. HB 17 passed 70–36. This could not be happening. It was time for another reading before it could be called for a final official vote. How much time would they give it? A man across the gallery from me shouted out something I couldn’t comprehend. Someone official scolded him. Then a lady in red next to him yelled back. She practically erupted. All political power comes from the people! As more voices joined in, I hesitated, but I did too eventually. What could this mean? Representatives from the floor encouraged us. They took our pictures. They smiled. They ignored us. They waved their arms. We continued. I flashed a peace sign back at them with a grin upon my face. I noticed that our interruption was interfering with their ability to proceed. We were holding them up and they had to stop what they were doing. We continued chanting until the gallery moderator called in security. They came in pairs of security, appearing to be a state trooper and another one with a handheld camera. The chanting continued. ALL political power comes from the people. After they approached, I moved closer to the door and stopped speaking. But I didn’t leave until security approached me too and asked me to exit the room. I hesitated, quietly protesting, “But I’m not doing anything! I just want to see what’s happening.” They said I still had to go. I slowly walked out of the gallery and into the hallway which was packed with people chanting, louder and louder, at a cadence as if the whole routine was choreographed. I felt the energy in the room full of people around the rotunda. There was no anger filled with hate or violence. This was angst, and this was people tired of the government calling secret sessions for power grabs with a hidden agenda. The chanting changed with a rhythm about it. Justice! When do we want it? Now! Justice! When do we want it? NOW! This was a violation of trust. This was chaos and this was confusion, but this was clear disrespect to the people of North Carolina. People were being arrested. The whole room cheered upon the first arrest. The gravity of the situation was setting in. I watched a middle-aged white man be taken out with plastic zip ties on his wrists. He was too far away for me to see his expression. All I could see was him being taken in the opposite direction from me. The lady in red, who really sparked the fire of the protests was taken away as well. Forward together, not one step back. Forward together, not one step back. More people were being arrested. I watched a white haired old lady in a green sweater be escorted out with plastic zip ties on her wrists. She looked fearless. My heart raced. I thought of my Grandmother. Later on I found out her age: 85 years old. This woman could be my Grandmother. We want Democracy! This is hypocrisy. We want Democracy! This is hypocrisy. More people were being arrested. I watched a man in a suit also taken out with plastic zip ties on his wrists. He looked fed up at the situation. Joe Killian, a reporter for NC Policy Watch, was arrested for simply remaining in the gallery to report, not protest. The protest chants continued. Who’s house? OUR house! Who’s house? Our house! Another old lady arrested. She looked worn down, but resolved. More people were being arrested. I watched a middle-aged well-dressed white woman be taken out of the gallery with plastic zip ties on her wrists. She smiled at the crowd. I watched a blonde man in his 20’s or 30’s be arrested and taken out of the galley with plastic zip ties on his wrists. The news was all around us embedded in the sea of protesters. A gentleman from Time Warner Cable drifted all around me with his “reporter’s notebook.” A woman from NPR was up front. Other news stations with their cameras were behind the crowd. If you haven’t heard it, the union song “We Shall Not Be Moved” is adapted from the African American Gospel song “I Shall Not Be Moved.” I’d heard it in Church and when I listened to, read, or watched things about the Civil Rights. The Freedom Singers performed it in Washington in the 60’s. Here I was singing songs from Civil Rights movements with people from the NAACP. It was amazing, inspiring, terrifying, and overwhelming. My hands were shaking and the adrenaline pulsed through my body. These people were taking a stand, to prove a point, that I could not risk involving myself any further in, like them. But I chanted, raised my arm, and sang too. Our leaders should not be calling special sessions under the guise of helping people. The bill in its final version was ratified in this form. See all the markup? I wondered what the House Rules were so I later verified how the Speaker could have had us ordered to be arrested. It seems 51: Admittance of the Press, 52: Extending Courtesies, and 53: Order in House Chamber, Galleries, and Lobby were all in conflict. We adhered to exercise our First Amendment though and there is no volume limit on the First Amendment. Once the gallery was cleared, Martin Brock, the Chief of Police, got on a bullhorn to call for quiet. He had an official lady standing next to him. The man leading the protests moved forward. He called to the crowd after he’d confirmed 20 arrests. We had a few options. 1) Stay and continue and we would be arrested. No thanks. 2) Leave and move on. Sounded good. 3) Depart and go support those who had been arrested. I pondered this, but my phone was nearly dead and my loved ones would be concerned that I had been arrested if I did not call someone soon. So I moved through the crowd to head down the regal staircase, into the cold, and head home. There were fathers and children. Old and young. Rich and poor. Black, brown, and white. We’d all been in this together. Taking a stand. At the bottom of the stairs, a woman thanked me. I asked who she worked for and where she was from. She was the Representative from Buncombe County. Asheville, NC. She thanked every person she could for being there and trying to help. I smiled at her bravery and gratitude. And I thought of one of my RESULTS advocacy mentors and how he tells me, “when people lead with action, they find inspiration.” He’s right. I was inspired. Then I called my boyfriend to say I was going to pick up my shoes from the shoe repair store and go home. He could turn around. I would not need to be retrieved from plastic zip ties tonight. First, a revolution, and then I’d get my marching shoes on. I was unable to return the next day, but I watched online and followed the events via NC Justice Center and NC Policy Watch (organizations I long to join), Twitter, and other news outlets. There were more arrests. There was a sit-in. Some people tapped on the glass of the galley, which led to more arrests. Curtis Gatewood, the man who I’d met from the NAACP, was arrested. Reverend Barber, the founder of Moral Mondays and another NAACP leader, stepped in to lead and spoke to the police chief and the press. 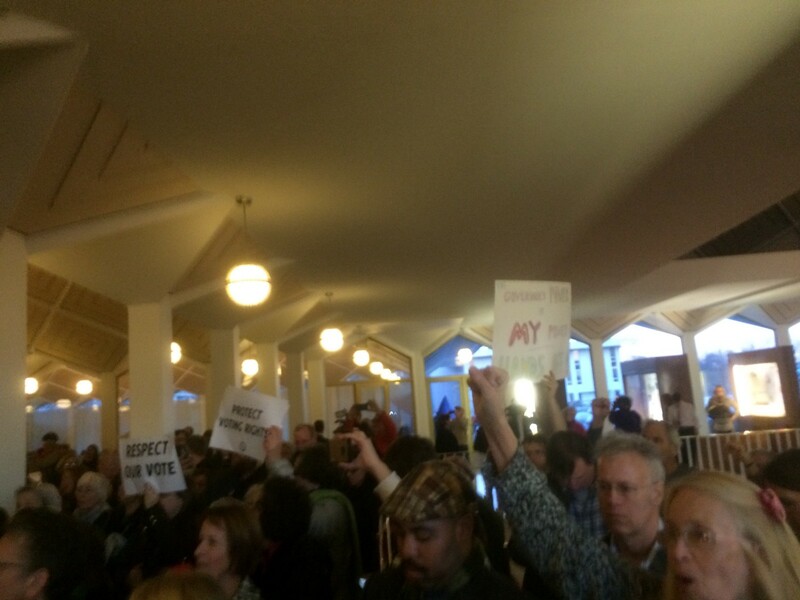 Of course, Governor Pat McCrory quickly signed HB17 instead law on Friday. It is a self-serving Bill which preserves his desires rather than “personally respecting the candidate the people elected” like he said he did a couple weeks ago. The Bill removes the power of appointments by the new governor who could impact his interests. What I, along with many other American and North Carolina citizens, would like to know is why is this allowed? Special sessions should not be called under a shroud of lies for special interests. Be truly transparent to the voters who you work for. These games are an embarrassment to our great state and I’m disheartened by it all. Hopefully, we can stop the deception and start thinking about worthwhile bills which help our education, health, a fair living wage, and other protective programs like tax credits which can lift people out of poverty are what we should be more concerned about. Interested in getting involved to make change in your community and beyond? Join me with RESULTS and RESULTS Raleigh to help create an end to poverty with regard to education, health, hunger, equality, and other economic opportunity issues in the United States and around the world. Follow me in IG and Twitter to learn more about the organizations I’m involved in, my advocacy work, travels, and passion for effective marketing communications to make a difference.